In the great hall of the castle will give a table carved solid oak surrounded by 14 chairs covered with leather and carved targets and also in the same wood. On the walls of this room made of fir planks, bears and wild boars trophies, the Carpathian deer, chamois and deer, the grouse, pheasant or lynxes simply invites you in green woods, where are the horses and outlaws flintele. 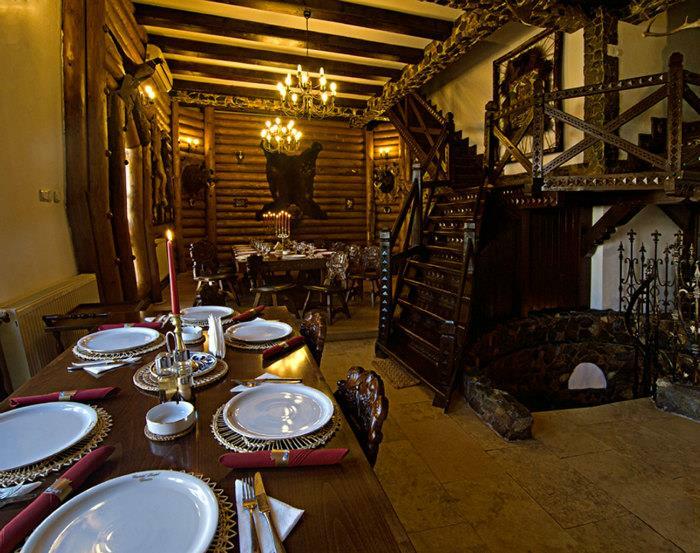 In this unique booth you can serve a sirloin skewer of lamb or a more rustic sprinkled with red wine, scallop deer, wild boar steak with baked apples, pineapple bear, hunter of deer buckling, bear or boar. Those are just some of the culinary delights that you can serve only in this special place. Romanian wines carefully selected accompany these special dishes to offer our guest a special flavor. Because this is where outlaws over time and with them will unleash adventure.